Today, my friends and I watched a wonderful rendition of Jane Austen’s Pride & Prejudice, in which radio actors combined their amazing vocal talents during a live recording session with a completely gratifying display of visual theater. Needless to say, it was one of the best adaptations of the novel I have ever seen! The following post, the third installment of the LWOM series, is a tribute to my this-is-as-wild-as-it-gets-Thursday-night-#nerdgasmic feelings about the performance. It is a truth universally acknowledged, that a single man in possession of a good appetite, must be in want of a cookie. 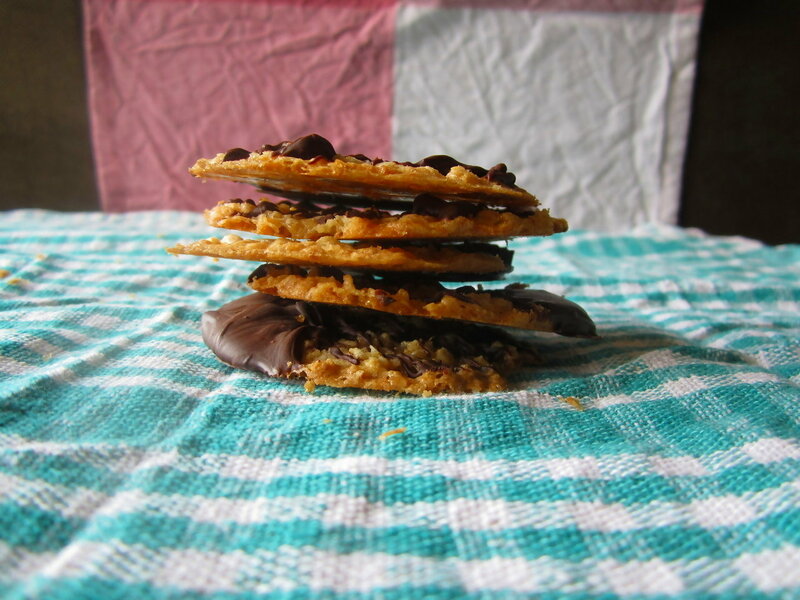 A thin, crisp, sweet chocolate-dipped lacey butter cookie. A man’s imagination, however, cannot be said to be much less rapid. It jumps with equal urgency from chocolate-dipped lacey cookies to homemade fondant-draped wedding cakes, with no clear connection between the two thoughts to speak of, and unrealistic expectations concerning the oven-labouring capacities of his would-be wife. If a woman is partial to a man, and brings over an entire tupperware-full of these quite delicious cookies, he must find her secret out. Men, after all, cannot rightfully be considered the stupider of the sexes; they are merely more deficient in those qualities that would render them competent judges of women’s whims. In a word, if he finds a box of these cookies at his doorstep and checks his own excitement just long enough to taste a single crisp thin wafer, he will undoubtedly have proposed to her within the hour. Or if not, he will at least have the decency to purchase a considerable swathe of flowers and send to her a round sum of no less than that which Martha Stewart makes in a year…in addition to his eternal, undying affection. In the real world in which we live, at least, this is how it should be. Whether or not the Mr. Darcy’s of Pemberley actually agree with this statement, is something best left to the personal scrutiny and experiences of the reader. The writer will not to affect to impose her moral views in this case. It is to be noted, however, that every single honest young woman is in want of a Mr. Darcy equivalent, and would be well-deserving of her fate if all such reserved young men would cross our paths in a romantic fashion (preferably a ballroom dance), and just do the damn thing and ask us to have dinner with them already. Or to visit a carnival. Because honestly, men, as much as we’re all products of the 21st-century and huge proponents of gender equality and all that jazz, every single one of us still wants on occasion to be treated like a Romantic-era lady. So says Jane Austen, the single rival to the Disney Corporation in successfully promoting bad matches and unrealistic ideals in girls all over the world. Yessir. Whatever you say, Mr. Darcy. Preheat oven to 325 degrees F. Cover baking sheet with foil and lightly grease foil. Set aside. In a bowl, combine oats, flour, salt, and baking powder. In a separate large bowl, cream together sugar and softened butter until very fluffy, or at least 2-3 minutes. Beat in egg and vanilla. Add dry ingredients and mix until just incorporated. Drop by teaspoonfuls onto a foil, about 2 1/2 inches apart. Your cookies will spread a lot, so make sure not to crowd them too much. Bake in preheated oven for 10-12 minutes, until golden brown. Allow to cool, then peel cookies gently off foil. You may want to use a new sheet of lightly-greased foil between each batch in order to ensure easy peeling (wrinkled foil will make it difficult to peel off your cookies). Heat chocolate chips in a microwave-safe bowl at 15-second intervals on high in your microwave, stirring chips vigorously at the end of each interval. Heat only until chips melt halfway; remove from microwave and continue stirring vigorously until all chips melt. Dip tops of cooled cookies into chocolate; set onto parchment paper and allow chocolate to harden. Pride and Prejudice is one of my favorite books. And it’s one where the TV/film adaptions are pretty good. I think my favorite adaption is the one where Colin Firth is Darcy and Jennifer Ehle is Lizzie. But don’t you think Mr. Hearst would have been the one to eat the last Chocolate-Dipped Lacy Butter Cookie? 😉 Good stuff – thanks. blog (I also love the theme/design), I don’t have time to read through it all at the moment but I have saved it and also added your RSS feeds, so when I have time I will be back to read a great deal more, Please do keep up the fantastic work. Pride and Prejudice is one of my favorite books, and I love the movie as well! These cookies look wonderful. I love my cookies thin and crispy! I fully endorse that sentiment–I love Austen novels. Thanks for taking the time to stop by and comment, Maral! I love lace cookies…they are so light and crisp and I always think they are at 0-calorie! hahaha…I love that you dip them into chocolate for extra flavor too.